I started reading the Divergent trilogy series because I was told it was going to be the next big thing. I can see why. It's pretty intriguing and it has many similarities to The Hunger Games trilogy, which could help or hinder Veronica Roth's brain child. This young adult fiction is set in an era post-something (War? Famine? Not sure...) in Chicago where the population is split into 5 factions, each with their own distinct qualities which dictate the kind of work they do and how they act. The selfless (Abnegation), the daring (Dauntless), the intelligent (Erudite), the honest (Candor) and the peaceful (Amnity). 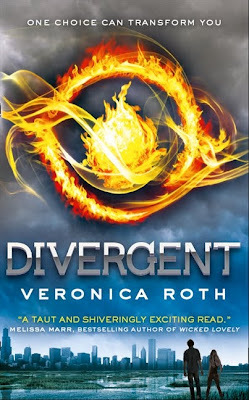 As with any popular book these days the heroine is a 16 year old misfit girl, Tris, who is going to save the world while having a little bit of a love story on the side. I am kind of over this character, if you want my complete honesty. Susan Collins, Stephanie Meyers and Veronica Roth are all drinking the same koolaid and we need someone to give me a new hero. Different age...different gender? It's just all too similar to me. The rights for the movie version have already been picked up by Summit entertainment, same people who butchered Twilight. I am not sure if the world that I envision while reading this book is something that can be translated onto the screen...or if I would think that this story would be something attractive outside of the novel setting, but we shall see. The second book is out and the third is due for publication in 2013. I am a little wary of how this is going to end as The Hunger Games has a horrible ending, but I am willing to stick it out.